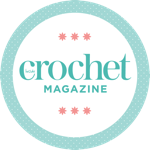 Find the pattern in issue 73 Inside Crochet magazine. Patt Row 1: 2ch (counts as tr)..... - 70(77, 86, 97, 106)cl, 2tr. Row 1: Miss 2 (2, 4, 5, 5)cl, 3dc in ch-sp, 3htr in ch-sp, Cl to end. Row 3: Miss 1, Rdec1, Cl to end. Row 4: Rdec1, Cl to end. Row 5: Rdec1, Cl to end.